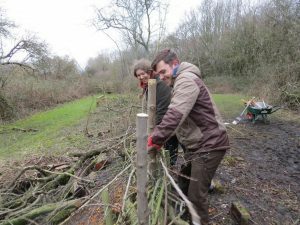 Skelton Grange Environment Centre is recruiting another batch of Volunteer Officers, thanks to funding from the Big Lottery and National Grid. “I arrived at Skelton Grange as a newly recruited Volunteer Officer at the beginning of February this year. Looking back at my time here, I cannot believe how quickly it has gone by. Upon arrival at Skelton, I instantly felt welcome by other members of staff and volunteers, which made my transition a whole lot easier. Initially, I was mostly shadowing and assisting with the education sessions being delivered to visiting school groups throughout the week. As I built up the confidence and necessary teaching knowledge, I eventually was given the opportunity to deliver sessions by myself. In fact, in my penultimate week at Skelton, I am happy to say that I have now introduced and lead an education day. This is something that I have been aiming towards throughout my volunteering experience. One thing I am sure about is that the support and feedback that I have received throughout my time here was fundamental to my development as a VO. Apart from the education side of things, I have been heavily involved in the site work that has been happening around Skelton Grange Environment Centre. I had never really done much practical work in the past, so I was very excited to try my hand in something completely new. As part of Green Team, our voluntary work day run every Friday, I have contributed towards a variety of projects on site. For example, the first project I was involved in was laying and binding a hedge on the other side of the road, close to the river bank. 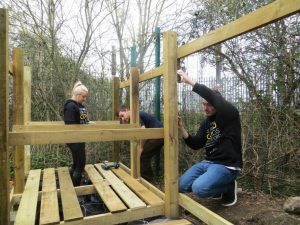 Completing this first project alongside other VOs and volunteers who help out regularly within Green Team was thoroughly enjoyable. It has been great getting to know new people, and when you share a completed piece of work together like that, there is a real sense of achievement and enjoyment for what you have done. Throughout my time at Skelton, I have been fortunate to have received some valuable training that could well be used or related to throughout future employment opportunities. For example, my Practical Tool Use training provided me with an insight into the huge variety of tools that can be used to carry out site work and the correct safety procedures that must be followed. As the weeks went by, I was able to put this training to good use, using them on a variety of site work projects. For instance, from having next to no carpentry skills at the beginning of my post here, I am now confident in my ability to accurately measure and build wooden constructions. I have contributed towards completing the wire meshing underneath the famous hobbit house, constructing the new wood store, making bird boxes, building the new decking, and most recently, designing a new bird feeding platform which is now located in the new bird feeding area. Other training that I have received includes Safeguarding, Leadership, Health and Safety for Leaders, Equality and Diversity, and Emergency First Aid training. The leadership training enabled me to take charge of site activities. For example, we recently have had RBS and M&S come in for Employee Action Days. I lead small groups on work developing the new minibeast habitat area which hopefully will be ready for action in the near future, as well as the new wood store. As one journey finishes, another is about to begin. I have been given the opportunity to assist in some fish abundance survey work this summer, working with the Environment Agency. I am sure that opportunities like this would not have come around if it had not been for my experience at Skelton Grange. 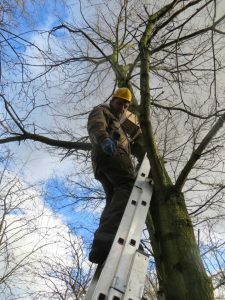 As well as regularly working outside, I have been able to demonstrate my enthusiasm towards the natural world and my passion for the management, monitoring and protection of the environment. I hope that this survey work will lead up nicely to the beginning of my masters this October. I have been offered to study an MA in Environmental Management and Consultancy at Lancaster University, though I am currently waiting to hear back from the University of Leeds, to determine whether or not I have been accepted to study an MSc in Sustainability and Consultancy, which would be my preferred option. As my experience as a VO at Skelton Grange comes to a close, I would just like to say a huge thank you to all the staff and volunteers I have worked alongside throughout the last 5 months. I can say with confidence that each and every one of you has contributed in some way to make my time at Skelton as enjoyable and rewarding as it has been. I will miss you all, though if I am in Leeds next year (fingers crossed), hopefully I will be seeing you all again soon enough! If you would like to become a Volunteer Officer here at Skelton Grange then visit our website for an application form and send it back to us before the closing date of 10am on Wednesday 22nd June 2016. Interviews are scheduled for the Monday 27th June, and the start date will be as soon as possible following this.